Core Exploration Ltd (ASX:CXO) has identified a 5km prospective copper trend within its Albarta Project in the Northern Territory that’s returned assay results of up to 13%. This new discovery at the northern Selins Prospect comes after CXO identified drill targets at the nearby Virginia Prospect and its debut drilling programme intersected high grade silver at the southern Blueys Prospect with grades as high as 1,070g/t. CXO has also found high grade silver-lead mineralisation at its neighbouring Inkheart Prospect with grades of up to 354g/t silver (Ag) and 11% lead (Pb). The company says these discoveries prove the viability of the Albarta Project and add to what it calls a “pipeline of high quality drill targets” flowing from the area. CXO’s 100% owned Albarta project covers over 2,000km2 of the highly prospective IOCG Aileron Province which lies 100km to the North-East of Alice Springs. CXO has acquired a cluster of 20 tenements that have a number of copper prospects as well as silver, gold and uranium. CXO is pursuing an exploration programme to firm up its understanding of the resources and provide estimates of their size and quality. The company’s long term goal is to develop its tenements at Albarta to the point where it can create a potential new silver and base metal province in the Northern Territory. A combination of mapping, rock chip sampling and analysis of historical workings has led to the discovery of a 5km prospective copper trend at CXO’s Selins Prospect, an area in the north-west of the central tenement that makes up its Albarta Project. Results from the rock chip sampling returned assays up to 13% copper at the Selins Prospect and the 10 rock-chip samples averaged 4.1% copper. CXO says Selins appears to be part of a newly identified 5km prospective copper trend, forming the western limb of an open fold within an area known as the Riddock Amphibolite. A historical copper occurrence is reported to be located on the interpreted eastern limb of the trend, possibly on the same lithological layer as the new discovery at Selins. To firm this up, CXO is now planning to undertake a sampling programme targeted at copper occurrences on the eastern limb of the fold and aims to confirm the existence of a significant copper resource. Follow up mapping is also being planned along with geochemistry testing over the outcropping geology and sediment covered plains to the north of the potential trend. CXO says results from the next round of work will enable the selection of targets for drilling across the Selins Prospect, whose host rocks appear have similarities in setting to its Virginia Prospect which is also in the Riddock Amphibolite. CXO says an Induced Polarisation (IP) survey has identified drill targets below a 1km long stratiform copper horizon located at the surface of its unexplored Virginia Prospect to the east of Selins. Two IP transects each measuring 1.5 km long show a consistent chargeable layer, according to CXO. The company says the depth to the drill target zone is generally less than 100m and 75 rock chip samples taken by it and previous explorers contain up to 34% copper with an average of 2.4% copper. These results have prompted CXO to commence work on securing the necessary approvals to begin an exploration drilling programme at Virginia in Q3 of 2014. An application has also been sent to the 2014 Northern Territory Government Geophysics and Drilling Collaboration program which provides up to A$100,000 including GST for greenfields exploration drilling projects. 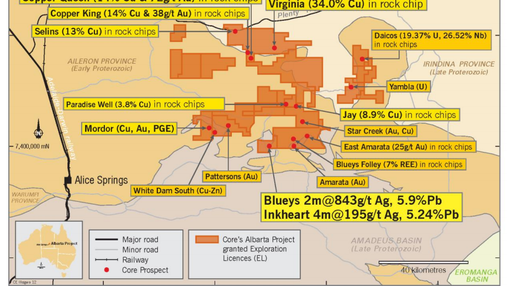 The identification of the new copper targets at the Virginia prospect follows on from the successful completion of the company’s maiden drilling program at the Blueys and Inkheart prospects. CXO’s maiden drilling program at the Albarta Project focused on the Blueys and Inkheart prospects to the south of its tenements and the company says 16 out of 17 Reverse Circulation (RC) drill holes hit anomalous silver levels. Intersects of high grade silver were made at the Blueys Prospect with grades of up to 1,070g/t silver and high grade silver-lead mineralisation at the nearby Inkheart Prospect was detected with grades of up to 354g/t silver (Ag) and 11% lead (Pb). CXO says the high grade silver and lead mineralisation was intersected in structurally controlled veins surrounded by broad lower grade mineralisation, all of it within the shales and dolomites of the Bitter Springs Formation that encompasses the prospects. According to CXO’s drilling assays and down hole geology, the mineralisation at the Blueys and Inkheart Prospects are part of the same mineralising system depositing metals in the Bitter Springs Formation. CXO says this opens up the tenement wide potential of the Bitter Springs Formation for the discovery of economic base-metal deposits. A second drilling programme of 3,000m of RC is being designed to test the full strike extent of the 2km long Inkheart Prospect and its connection to high grade mineralisation at Blueys. It will also conduct regional exploration over the surrounding Bitter Springs Formation. Work is planned to commence in Q3 of 2014. CXO’s Managing Director Stephen Biggins says the company is pleased with the results. “The value of Core’s strong tenement position in the NT has been enhanced by the discovery of a new high grade system at Inkheart especially considering that this is the Company’s first drill program at the Albarta Project,” he says. As CXO ramps up its drilling and exploration programme in the Northern Territory, the company has appointed Adelaide-based geologist Colin Skidmore as its new Exploration Manager to replace Michael Schwarz who moves to a non-executive Director role. CXO says Skidmore has a reputation for taking exploration projects through to development and his primary role at CXO will be to drive the development of the company’s recent discoveries and emerging prospects. Skidmore’s previous role was with Investigator Resources Ltd where he was Project Manager of its Paris silver project in South Australia, taking it through resource definition and regulatory approvals for feasibility. Prior to that, he worked PepinNini Minerals’ as Exploration Manager where he was responsible for establishing its South American subsidiaries targeting precious and base metal systems, exploring its South Australian Musgrave Project and overseeing the Crocker Well Uranium resource definition and feasibility study. CXO has also extended Managing Director Stephen Biggins consulting services contract on similar terms for a further two years until July 2016. The results of CXO’s latest round of exploration drilling and testing have set up a number of continuing efforts across its Albarta Project in the Northern Territory. CXO is planning a second drilling programme which will test the strike extent of a 2km long area within Inkheart Prospects and whether it links to its high grade mineralisation discovery at Blueys. The company’s next steps also include carrying out a regional exploration over the area neighbouring the Bitter Springs Formation target geology. It’s estimated that the upcoming drilling programme will start in the third quarter of this year. A further round of sampling and mapping at the eastern limb of the Selins Prospect is also being planned along with an exploration drilling programme at the Virginia Prospect, both of which are set for Q3 of 2014. CXO is an Adelaide-based company that holds prospective tenements in the Gawler Craton and Curnamona Craton of South Australia, along with the new confirmed, highly prospective IOCG Aileron Province geology in the Northern Territory.